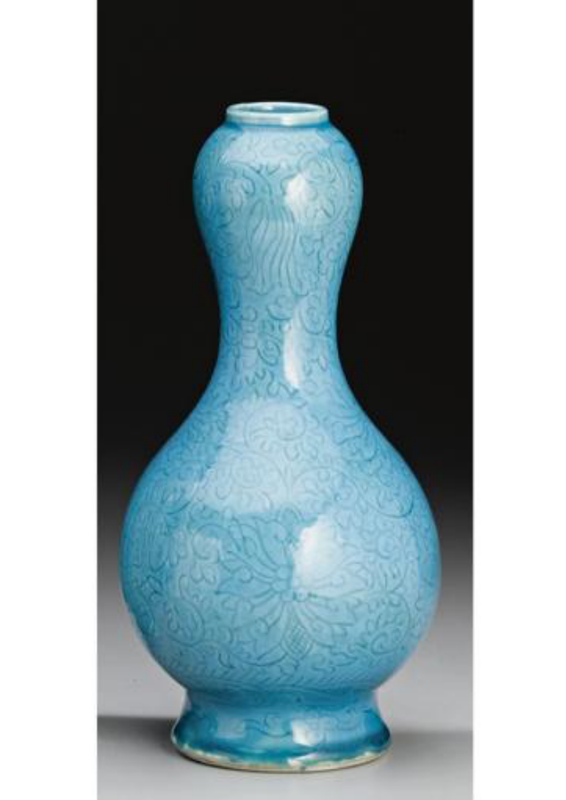 NOTE: This vase is exceptional for its magnificent size and fine glaze in imitation of Song dynasty 'Ru' ware. The crackled wares of 'Guan' , 'Ge' and 'Ru' of the Song period were highly regarded by the Qianlong emperor who not only collected them but also commissioned the making of new porcelain with similar glaze from the Imperial kilns for his appreciation. 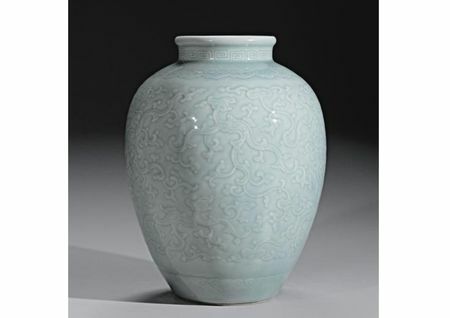 The present vase is an outstanding example of the very high quality monochrome wares produced in the Imperial kilns at Jingdezhen during his reign. 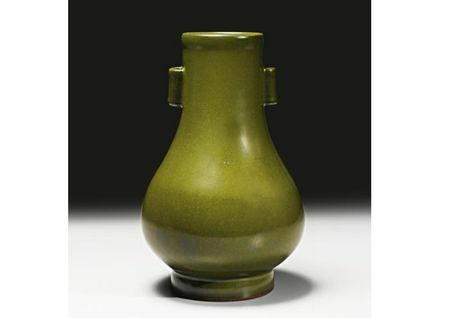 NOTE: It is unusual to find a pear-shaped vase with lug handles in the teadust glaze. 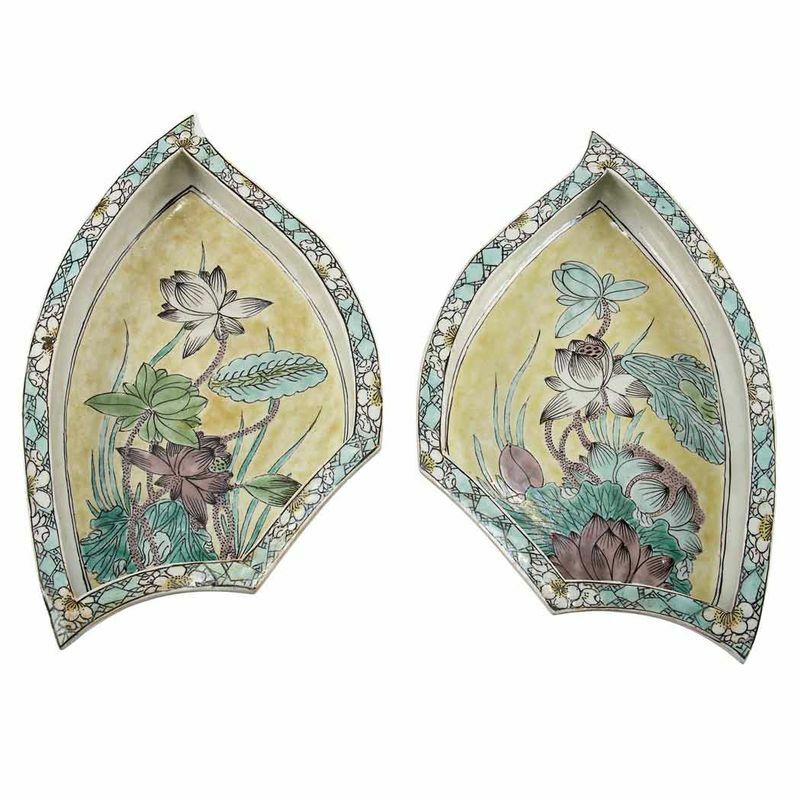 The form harks back to the archaic bronze hu and the glaze imitates the green patination found on bronzes. 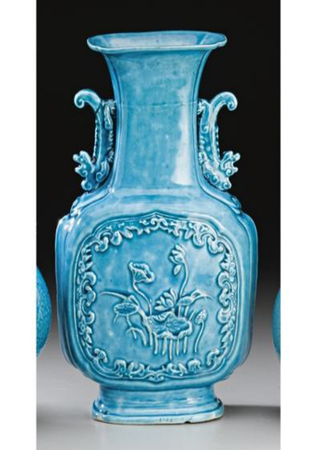 A flambé-glazed Yongzheng marked vessel in the Palace Museum, Beijing, is illustrated in The Complete Collection of Treasures of the Palace Museum. Monochrome Porcelain, Hong Kong, 1999, pl. 180. A teadust-glazed vase of the same shape was sold in our Hong Kong rooms, 9th October 2007, lot 1524. 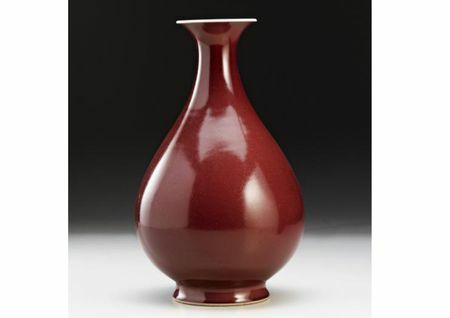 NOTE: The use of copper-red glaze at Jingdezhen was revived by the Kangxi emperor after the decline in usage during the late 15th, 16th and early 17th centuries. 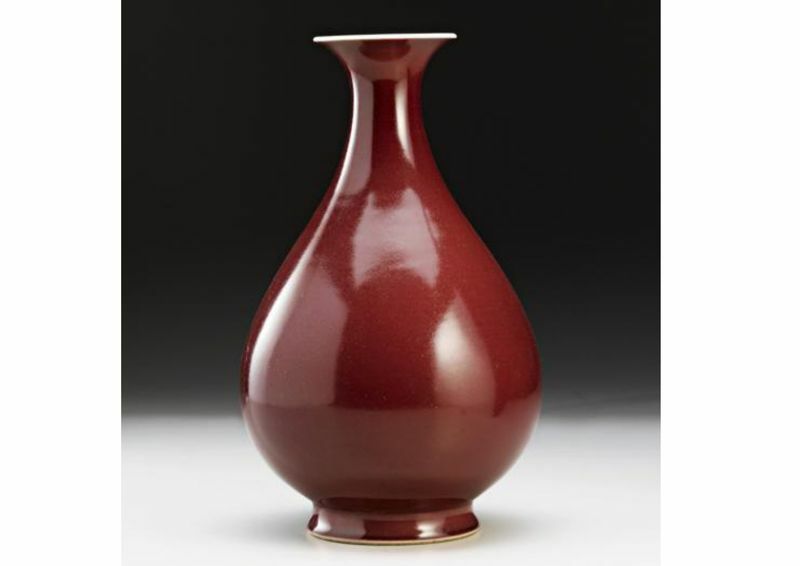 With the effort to reproduce classic Ming sacrificial-red (jihong) porcelains, Qing copper-red pieces quickly outnumbered their Ming counterparts. 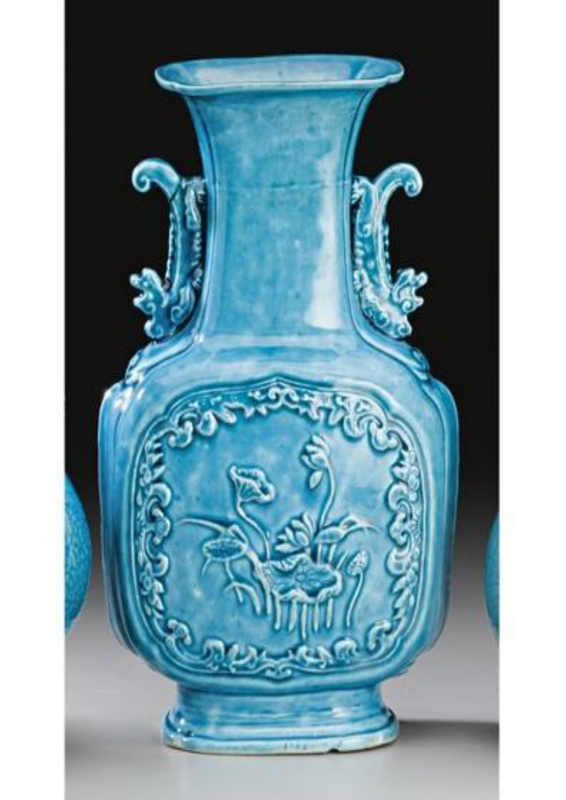 Nigel Wood in Chinese Glazes, London, 1999, p. 180, notes how the French Jesuit missionary, Pere Francois D'Entrecolles (b. 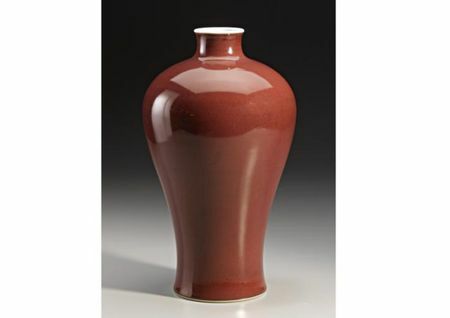 1664-1741) wrote letters giving detailed accounts of the copper-red production at Jingdezhen, the sourcing of the copper for the glaze, the recipes and the kiln location of the firing of these wares. 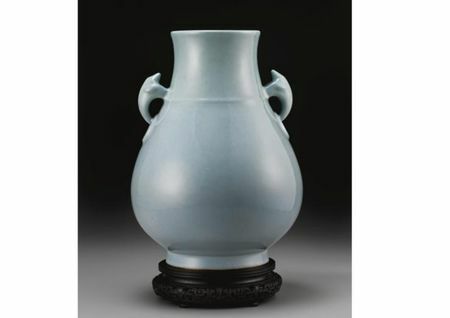 D'Entrecolles was aware of the difficulties involved in the making of copper-red wares and his account confirms the high level of technical knowledge of the potters at Jingdezhen. 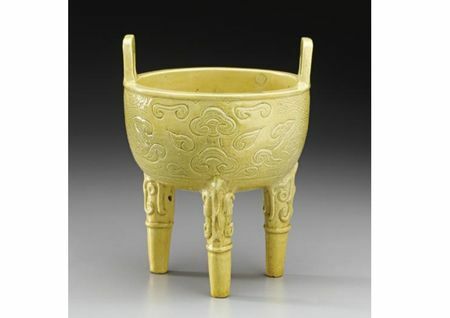 Although copper-red pieces can be readily found from the Kangxi and Yongzheng periods, by Qianlong's reign they become fewer in number. 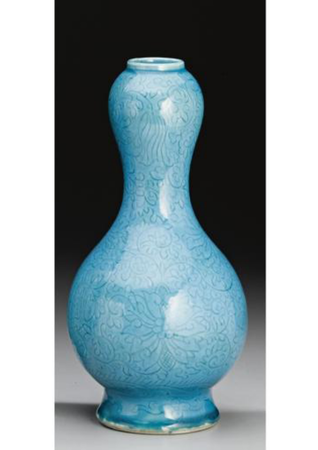 A small number of Qianlong mark and period examples are recorded. 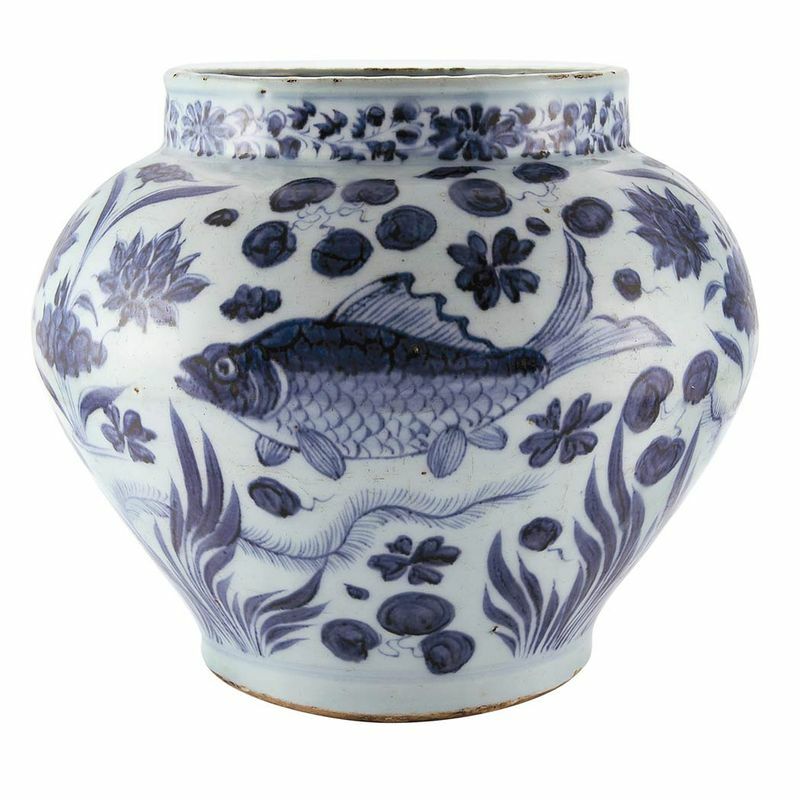 See a slightly smaller meiping in the Roemer Museum, Hildesheim, also with a Qianlong reign mark and of the period, illustrated in Ulrich Wiesner, Chinesisches Porzellan, Mainz am Rhein, 1981, pl. 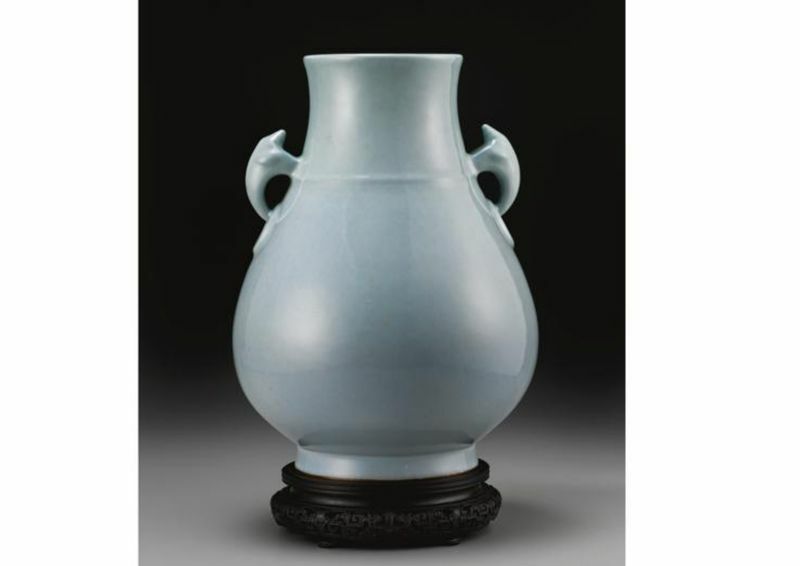 99; and another sold in our Hong Kong rooms, 10th April 2006, lot 1521. Another vase of this form and glaze, from the collection of Professor Ross Edman, was sold in these rooms, 23rd September 1995, lot 426 and again, 18th March 2008, lot 151. 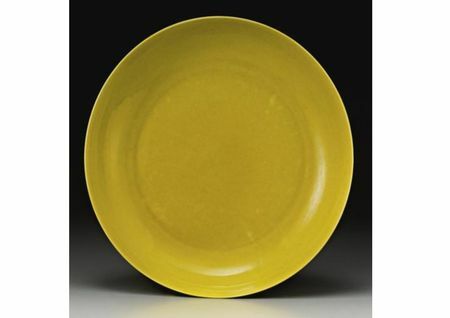 PROVENANCE: E. T. Chow Collection. NOTE: A related celadon vase, also with a Qianlong reign mark and of the period, was sold in our Hong Kong rooms, 9th November 1982, lot 231; and another unmarked celadon vase carved with peony scroll and dragons was sold at Christie's New York, 16th September 1999, lot 363. PROVENANCE: Pierre Sudique, Paris (according to label). naturalistically modeled in the form of a lingzhi fungus, the washer further centered by a ruyi head with its stalk continuing down to the underside and dividing into three further ruyi heads to form the feet, covered overall in a pale white glaze with wide black craquelure interlaced with finer pale brown craquelure; width 10 in., 25.5 cm - Estimate 8,000 - 12,000 USD. 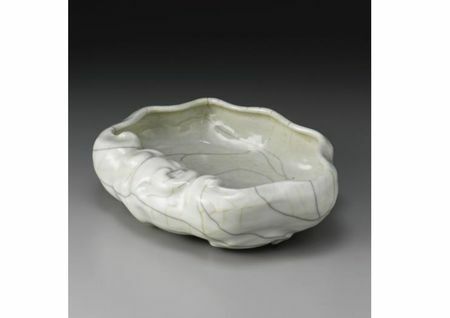 NOTE: A smaller washer in the shape of a lingzhi and also covered with a glaze imitating 'Guan' ware, is in the Collectionof the National Palace Museum in Taipei, Taiwan, and illustrated in Harmony and Integrity. 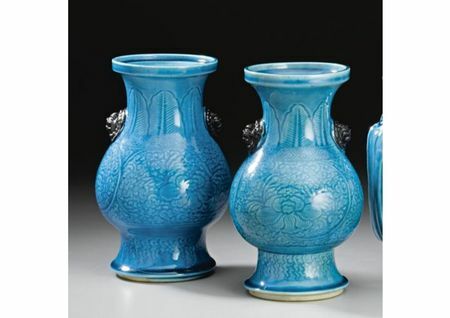 The YongzhengEmperor and His Times, Taipei, National Palace Museum, 2009, p. 254, pl. II-77.